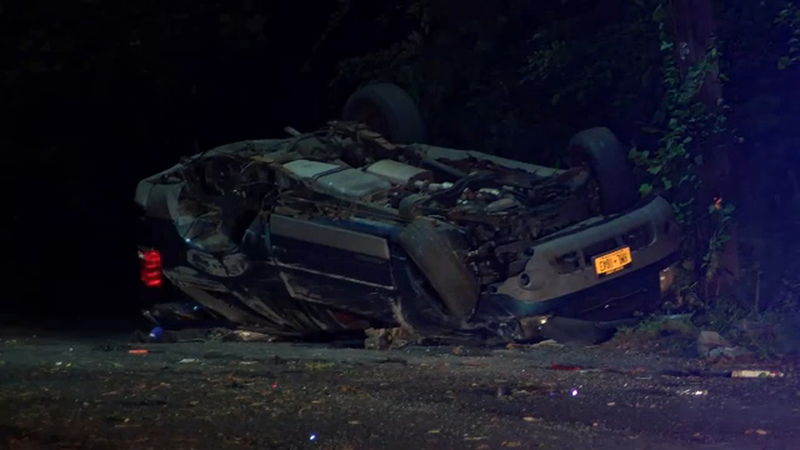 MELVILLE, Long Island (WABC) -- A Long Island man is facing multiple charges, including DWI, after police say he fled in a stolen car and crashed early Saturday. According to Suffolk County Police, an officer observed 19-year-old Justice Bennett of Bay Shore driving recklessly on New York Avenue on East 15th Street in Huntington Station at 3:12 a.m. He was in a vehicle reported stolen from Bay Shore about 45 minutes earlier. When an officer tried to pull him over, police say Bennett fled, and the car overturned and crashed at Old Country Road in Melville. Bennett was hospitalized with serious injuries. A 13-year-old passenger and two 14-year-old passengers in the vehicle were taken to Nassau University Medical Center for treatment of non-life-threatening injuries. Bennett is charged with criminal possession of stolen property, aggravated DWI, endangering the welfare of a child and unlawful fleeing of police.